Jonathan Chait, race, and Obama’s presidency: What about the experience of black Americans? Jonathan Chait’s look at race during the Obama era is missing one thing: black Americans. 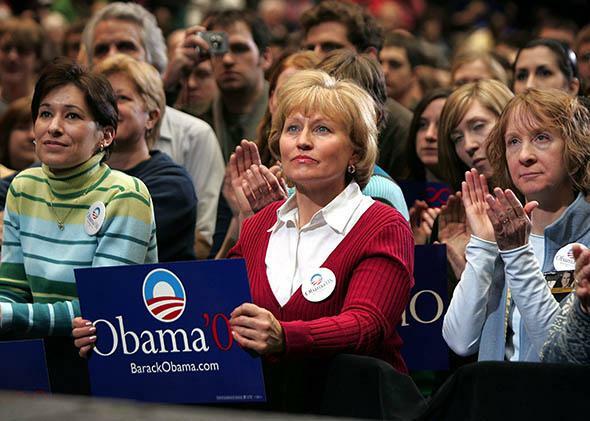 Obama supporters await his arrival at an Iowa State University rally on Feb. 11, 2007. If I were outlining a racial history of the Obama administration, it would begin with policy: A housing collapse that destroyed black Americans’ wealth; a health care law attacked as “reparations” and crippled by a neo-Calhounite doctrine of “state sovereignty”; a broad assault on voting rights and access to the polls, concentrated in the states of the former Confederacy. Indeed, it would focus on the deep irony of the Obama era: That the first black president has presided over a declining status quo for many black Americans. In short, it would treat race as a real force in public life that has real consequences for real people. You should contrast this with Jonathan Chait’s most recent feature for New York magazine, where the story of race in the Obama administration is a story of mutual grievance between Americans on the left and right, with little interest in the lived experiences of racism from black Americans and other people of color. It’s a story, in other words, that treats race as an intellectual exercise—a low-stakes cocktail party argument between white liberals and white conservatives over their respective racial innocence. That might fit the experiences of a mostly white pundit class, but it has nothing to do with race as experienced in the “day-to-day” lives of ordinary people. When a twentysomething black New Yorker talks about race, she isn’t as concerned with the rhetoric of Republicans as she is with the patrol car that trails her teenage brother when he rides his bike to the corner store. In any case, Chait marshals an impressive amount of evidence to make two points: First, that “racial conservatism” and ideological conservatism have become one and the same, and that this is true for “racial liberalism” and ideological liberalism as well. What’s more, Chait argues that the worst suspicions of both sides are true: Conservatives have leveraged racial resentment in service of other political goals, and liberals have wielded the word racist as a weapon against their foes, regardless of the offense. Of course, it’s not accusing conservatives of “racism” to note that particular policies—say, tax cuts to defund the social safety net, or blocking the Medicaid expansion under the Affordable Care Act—have a disparate impact. That’s just reality. And it’s not tarring your opponents to note that race plays a huge part in building popular support for those policies. But again, for as much as this is interesting as a matter of political combat, it’s less important to telling the story of race in the Obama years than, for instance, the tremendous retrenchment of racial inequality during our five years of recession, recovery, and austerity. Yes, the Return of the White President will cause this tension to recede, as arguments over racial innocence—“You’re racist!” “You’re a race baiter!”—fade like the elves of Middle-Earth. But that’s only the end of the story if you’re most concerned with partisan fights. If it’s policy that dominates your racial history of the Obama era, the future is uncertain and filled with questions. By gutting a key provision of the Affordable Care Act, Chief Justice John Roberts has left a gaping hole in Medicaid coverage, cutting millions of blacks and Latinos out of the benefits of the law. Will we fix this, and if we don’t, what does that mean for the fight against racial inequality in our economy? Will we do anything to rebuild black wealth and end the long-term unemployment crisis in black communities? Will we end the drug war and move against mass incarceration? Will we buck the Supreme Court and push back against the conservative campaign to dismantle the Voting Rights Act? Will we leave millions of Latino immigrants on the margins of society because a white conservative minority refuses to sign on to immigration reform? And so on, and so on. You could argue that answering these questions—and finding solutions—requires a focus on the nature of racial conversation during and after the Obama era, in which case, Chait’s focus is well-placed. If racial conservatism is indistinguishable from its ideological counterpart—if attitudes toward blacks are determinative of attitudes toward government, and vice versa—then that poses a tremendous challenge to ameliorating racial inequality and injustice, both by way of government (a strong social safety net) and its restraint (criminal justice reform). Still, if you’re trying to tell the story of race in the Obama years, Chait’s version strikes me as utterly ancillary. First and foremost in this history has to be the ways in which race kept its material salience despite the momentous political event of a black president. The partisan reactions to Trayvon Martin and Jordan Davis are less important than the activism that emerged around them, in the same way that Republican complaints of language policing are less important than the party’s ongoing push for voter suppression. Race matters for reasons far beyond the fact that it is another battleground for partisan combat.